impromptu performance of "Ode to Joy" to a couple of surprise guests at their summer camp. But if any of the fledging Duanes, Dickeys and Berrys felt nervous, they didn’t let it show. 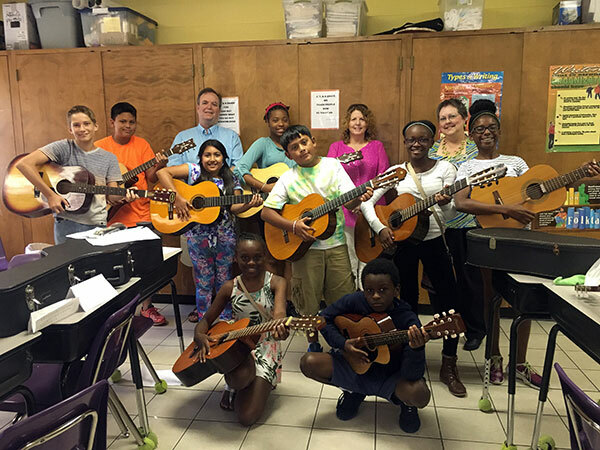 "They only had about ten minutes' notice before performing the ensemble," said Terry Cantwell, who gave guitar lessons to students attending St. Peter Claver Catholic School's Camp Cougar. "They played wonderfully. I'm very proud of them." contributions went further than lessons. schoolchildren in the surrounding midtown neighborhood. He knew that few, if any, of the campers would have access to guitars. So he posted a notice on his personal Facebook page asking folks who owned guitars they no longer used or wanted if they would be willing to donate them to Camp Cougar kids. A man Cantwell had never met who lives in Atlanta bought a guitar and shipped it to him. A woman called Cantwell in tears and said she wanted to donate a guitar owned by her recently deceased brother, knowing he would have loved seeing a child continue to make music with it. A friend of Cantwell who works at WMAZ, Erica Carr, got a short news story aired. As a result, more donated guitars – and money - flowed in. A GABBA representative contacted him and, after taking the proposal to the association's board of directors, arranged for the purchase of two guitars to donate. contribute to the development of the musicians of tomorrow," said Potter, who is GABBA's president. "We were excited to be able to donate to this program." Cantwell ended up with more than 20 donated guitars to give to Camp Cougar children. "Every Monday during camp I taught two groups of kids in forty-five minute sessions," he said. "The groups began small, with two or three kids, then grew to around a dozen students each. In total, I met with about thirty kids in different sessions. They were expected to practice every day, supervised by one of the camp aides. neophytes and teach them the rudiments of 'Ode To Joy' and another song, 'Aura Lee.'" chance to keep at their lessons. "I'd really like to continue the class in the coming year," he said. Sounds like he'll need more guitars. If you've got one you'd like to donate, email Cantwell terryat317@gmail.com. Photo: Terry Cantwell, back row left, and some of the Camp Cougar students, along with two visitors from GABBA.